iPhone, check. Headphones, check. GPS watch, check. I don’t even put on my running shoes until all these items are accounted for. Once I make the mile-run to the closest trailhead, I find every tree trunk, log or rock on the edge of the path—I’m trying to locate a spot to rest my iPhone on the ground so I can take a decent “runfie,” a selfie of me running. Meanwhile, music blares through my headphones as my feet hit the dirt. I keep the volume low enough so that I can still hear my GPS beep every mile to inform me of my pace. When I finally see the perfect tree trunk, I turn my timer app on and run away from my phone, then back toward it to capture a shot of me running. I make sure the picture is okay, which it’s not, so I try again. As soon as I capture a better picture, I keep running. A few minutes later, an all too familiar song comes on my playlist and I stop to find a new one. I don’t see anything I like on any of my playlists and decide a podcast fits my mood better. My GPS beeps to inform me I’ve reached another mile. Looks like I’m halfway done. I turn around. A few minutes later, I come across the perfect background for an unplanned runfie. I stop to grab another picture. “That’s the shot,” I think to myself. I get back to my apartment and look at my phone to see the numerous runfies I took. I immediately upload it to Instagram and think of something clever to put in the description of the photo. As I walk up the stairs to my apartment building, I look down and realize my watch is still tracking my run. I stop and save the workout and it tells me my splits were negative. The satisfaction of this run doesn’t come from these negative splits though, it comes from how awesome my runfie was. Since entering the online running community a few years ago, I’ve been lured me into logging nearly every run with a picture or tweet. On one hand, I believe my online presence has opened up several doors for me. I’m now a contributing writer for a local running magazine and numerous running websites. But on the other hand, I’ve lost sight of the real goal—enjoying a run all on its own. After realizing several weeks ago that negative splits don’t satisfy me more than a good runfie does, I decided to do something. 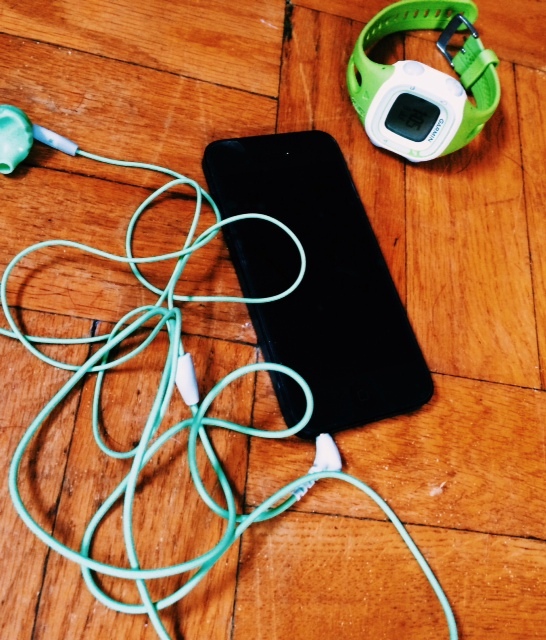 On National Running Day, I made a resolution to “unplug.” I took my GPS watch off my arm, left the headphones tangled up on my dresser and took one last look at my phone to see what the time was before heading out. As I reached the trailhead a mile into my run, I wasn’t looking for the perfect tree trunk, log or rock on the edge of the trail. The trail looked like a completely different forest to me. I could hear the sound of the birds chirping in my ears and saw the large, green, leafy trees surrounding me from every angle. Every step I took felt like I was becoming more in tune with the environment around me. I felt naked without my headphones and GPS watch but more importantly, I felt free. I didn’t need the sound of a podcast or playlist to distract me. I was letting nature take me on the run. The weeks to follow, I began setting aside more and more days to be unplugged. I craved the sound of water moving through the creek more than I did a good podcast. It seems these days many of us can’t enjoy a good meal or run without capturing a picture of the experience. But how do we enjoy the actual experience if we don’t take the time to enjoy it in the moment. Capturing runs with pieces of technology has its place, but unplugging does as well. Everything in life has its balance—social media runners are allowed balance, too.